From icebox manufacturing in the late 1800s to modernized walk-in refrigeration units today, Dent Design Hardware has consistently maintained a standard of quality, dedication, and innovation found nowhere else in the industry. The Dent Hardware Company was founded in 1894 by Henry H. Dent, whose "keen discrimination and unfaltering energy" quickly turned "DENT" into a household name. In 1898 the Dent Hardware Company began producing some of the finest cast-iron and aluminum toys on the market, which to this day are still sought out by antique collectors. Dent's horse-drawn wagons, planes, tractors, and motorized fire trucks have made a lasting impression on children, and children at heart, all over the United States. And, when Dent began to offer die-cast toys instead of cast-iron, he changed the toy industry forever with other companies quickly following in his footsteps. The Dent Hardware Company was also the leading manufacturer of ice boxes (the earliest form of the refrigerator) from the late 1800s through the 1920s. Dent's signature ornate latches, handles, and hinges have made a timeless impression of elegance. Dent Design Hardware is pleased to continue to offer these durable and timeless classics in addition to our modern product line, as we still receive many requests for replicas of our vintage hardware for special building projects. Click here for more information on our vintage hardware replicas. As most small businesses, Dent has also experienced its fair share of change. In 1955 Harry C. Dent, grandson of Henry H. Dent, split away from his business partners to form his own company, Dent Manufacturing. Dent Manufacturing flourished, expanding its facilities to include 22,000 square feet of space. Douglas Dodge joined Dent Manufacturing in 1972 as an engineer, becoming the general manager a few short years later. After a long, successful run with the business, Harry C. Dent retired and sold Dent Manufacturing to the Dodge family. Dent Manufacturing was then restructured in 2007 as Dent Design Hardware. Today we are stronger than ever, as are our products. Dent remains a trusted name in the commercial refrigeration industry and our innovation, dedication, and inspiration has remained steadfast through the years. Click here to see our complete online catalog. TO SEE OUR CURRENT AND PAST DENT INTERNS! 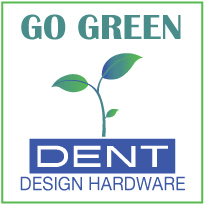 Dent Design Hardware is a small business locally operated out of Pennsylvania, USA. Small enough for personalized service. Localized sourcing, quality materials, engineering ingenuity, and a tradition of innovation. © Dent Design Hardware, Ltd.